Livermore Fire Station 6 houses a century-old light bulb that still works. There’s a warm winter’s day and there’s a freakish warm winter like the one we’re having. For weeks the daily low on Mt. Hamilton summit has been in the high 50s to low 60s. What better time to do the Mt. 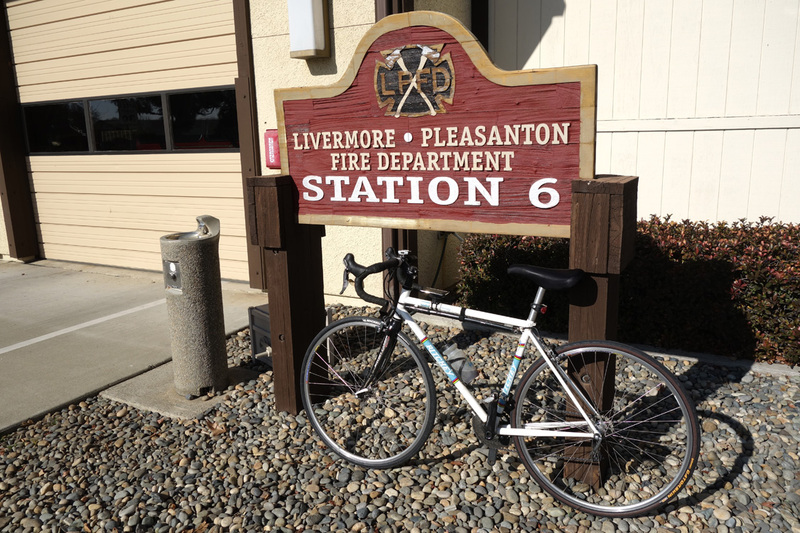 Hamilton loop to Livermore and back? I figured I could do the entire ride in shorts and maybe even a short-sleeve jersey. Starting Sunday at the base of Mt. Hamilton, the temperature was in the mid-40s at 7:30. Within 15 minutes I had climbed above 1,000 feet where it was already in the low 50s. By the time I reached Halls Valley (Grant Ranch Park) it was in the mid-60s and it stayed that way to the summit. The land is parched on the backside of Mt. Hamilton. No flowers. Not a blade of grass. There’s only one pond with water near the road, where there are usually a dozen. As I passed Arnold Ranch, the flower bed so painstakingly maintained along the road dried up. I’d be surprised if we saw a single daffodil this year. I pulled into the Junction Store and fortunately it has re-opened, under new ownership. I jokingly told the owners I would try JotEmDown store if they were still closed. Another benefit about this day’s weather was the lack of wind. It’s usually a slog riding on Mines Road with a steady headwind. It got so warm I had to shed my long-sleeve jersey. In Livermore I checked out the centennial incandescent light bulb inside Fire Station 6 on East Avenue that has burned for more than a century. However, as expected, the station wasn’t open. You’ll need to plan your visit on a special day to get a look. With a nice tailwind, I took Stanley Boulevard to Pleasanton, a pleasant-on experience now that the bike lane is complete. Riding by Calaveras Reservoir, which is receiving a stronger dam, I noted a fair amount of water. This entry was posted on January 21, 2014 at 7:41 pm and is filed under Ride reports. You can follow any responses to this entry through the RSS 2.0 feed. You can leave a response, or trackback from your own site.